How Many Calories in a Whole Tuna Sandwich on Wheat? Although tuna and whole-wheat bread are both relatively low in calories, trouble starts when you add mayonnaise to the mix. Commercially-prepared tuna sandwiches tend to be high in this fatty ingredient, and may also be served on oversized bread for a one-two calorie punch. 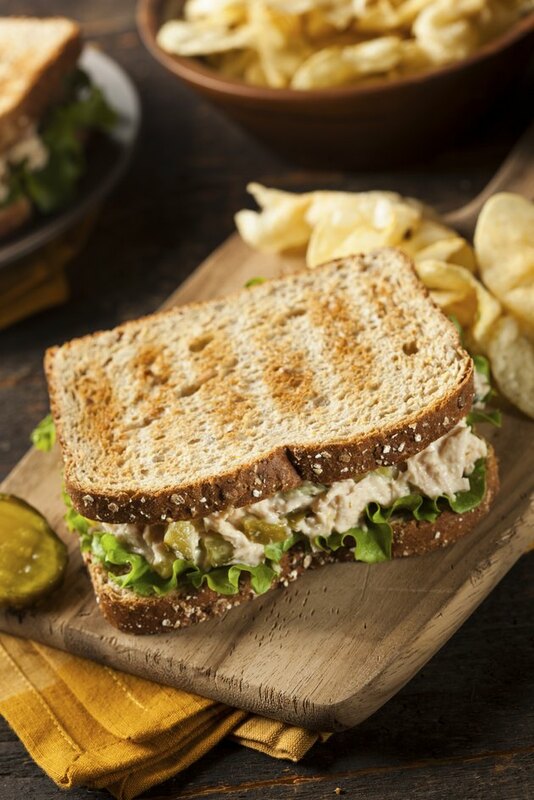 To spare your waistline, make your tuna sandwiches at home using moderate portions and lean ingredients and use a calorie counter app to track the nutritional value. At a restaurant, a whole tuna sandwich on wheat may contain up to 600 calories, depending on the recipe and size. However, homemade versions can be far lighter. Using two slices of whole-wheat bread, 3 ounces of water-packed tuna and 1 tablespoon of light mayo, you'll create a sandwich of about 310 calories. Mixing chopped celery or shredded carrots into the tuna won't add significant calories, but will add nutrition for a more-balanced meal. How Many Calories Are in a Tuna Sandwich?